You can buy anything from a tiny mobile phone to an outsized refrigerator with that familiar Samsung logo on it. And, in most cases, you can be assured of a good level of build quality at a very reasonable price. 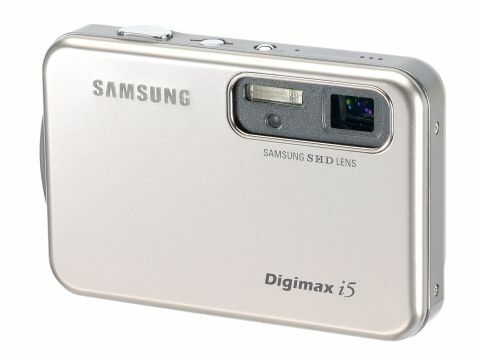 The Digimax range has always followed suite, offering reasonably well-crafted models at very competitive prices. Suitably enough, the i5 comes in a full metal jacket, which goes as far as having a clever, motorised, sliding metal panel to protect the lens and flash when you switch the camera off. Throughout, the camera looks far more impressive than its price tag would suggest. A fairly typical range of features begins with a 5Mp sensor, continues through a 3x optical zoom lens and ends with multimode autofocus, metering and flash. However, the 2.5-inch LCD is more, considering the sub- £200 price and the i5 also has a particularly cunning feature up its sleeve, in the shape of 'Safety Flash'. This is a special mode that aims to emulate the use of flash to pick out detail and avoid blurring in low-lighting conditions, without actually using the camera's built-in flash at all. The sample shots on Samsung's website certainly look impressive enough but, in practice, we found that while images using the Safety Flash feature were surprisingly clear, they were also very noisy. The i5's rechargeable battery pack should last for about 160 shots and is recharged via the docking station that's supplied with the camera. You can also make use of a very generous and unusual 50MB of internal memory before resorting to SD cards. Like all too many Digimax cameras we've seen in the past, the image quality of the i5 is good, but not as good as some competing models. In particular, the photos we took on the i5 lacked the sharpness of other cameras in the group, while colour in lowlight areas tended to become a little muddy.